Rome's nickname is The Eternal City. The history of Rome spans more than two and a half thousand years, and the city is considered to be one of the birthplaces of western civilization. Rome is home to more than 900 churches and has been the seat of the Papacy since the 1st century AD. The historic center of Rome is a UNESCO World Heritage Site. Rome and its suburbs extend for more than 170 square miles. A famous myth has it that Rome was founded on April 21, 753 BC by Romulus and his twin brother, Remus, at the site where they were suckled by a she-wolf as orphans. In truth, the city has its roots in the 9th century BC, which is when it emerged as a small Latin village. From there, Rome grew to become the capital of the mighty Roman Empire and is today credited with being one of the birthplaces of western civilization. The city's fascinating story is told through a rich supply of historic sites and museums, and romance lies around virtually every corner. Just like Rome wasn't built in a day, however, you'll need more than 24 hours to fully appreciate everything that the city has to offer. Best to take it slow and bask in the glory that is the Italy capital. Before the 1954 film Three Coins in the Fountain brought fame to the Trevi Fountain, it was a largely overlooked Rome attraction. These days, it is a must-inclusion on Rome itineraries. 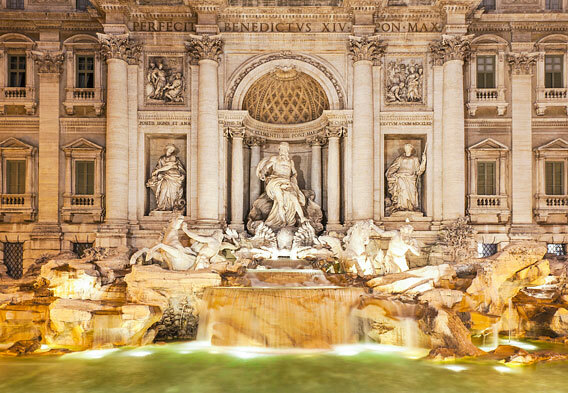 Well restored, the Trevi Fountain is based on the design of Nicolo Salvi and was completed in 1762. 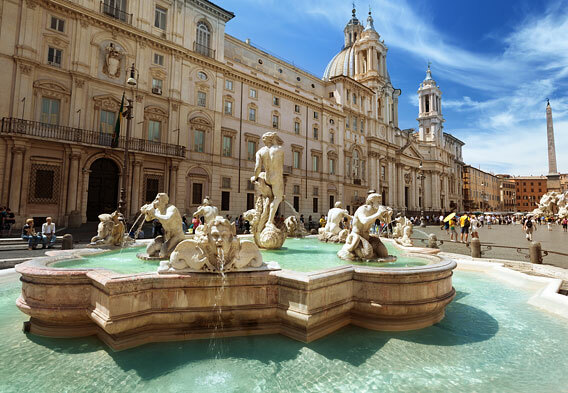 It is the largest Baroque fountain in Rome, measuring approximately 86 feet high and 161 feet wide. Only serving to accentuate the beauty of the Trevi Fountain is its magnificent backdrop - the Palazzo Poli (Poli Palace, pictured). Visitors can take it all in from the small plaza out front, and as is customary, many people take the opportunity to throw a coin with their right hand over their left shoulder into the fountain. According to legend, this ensures that they will one day return to Rome - The Eternal City. At the center of the Trevi Fountain is Oceanus, or Ocean. Oceanus was the personification of the World Ocean - an immense river that flowed around the planet. One one side of Oceanus is a restless horse that represents the violent strength of the sea. One the other side is another calmer horse, which represents how the sea can also be tranquil. Other characters complete the image, including two allegorical figures that represent good health and fertility. One of the best things about the Trevi Fountain is that it is centrally located and can be found within close proximity of many of Rome's other top attractions. To the near north are the Spanish Steps and the prime shopping strip that is the Via Condotti, for example, and trekking west of the Trevi Fountain will lead you towards the Pantheon and then the Piazza Navona. The Piazza Navona (pictured), it should be noted, is home to another famous Roman fountain - the Fountain of the Four Rivers. Heading south of the Trevi Fountain, you can make the walk to the Vittorio Emanuele Monument before entering the realms of Ancient Rome and Palatine Hill. In this general area, such attractions as the Roman Forum, the Circus Maximus, and the Colosseum await. Branch out to the east of the Trevi Fountain instead, and you can soon be on the Via Veneto, which is one of Rome's most famous and expensive avenues. Rome is home to an impressive amount of hotels. These hotels range from five star gems that are among Europe's finest to more affordably priced establishments and can satisfy budget-conscious travelers. Many of the Rome hotels serve breakfast, though it is not always included in the rates. If you want to make sure that breakfast is included in the upfront price, you can always book a stay at a true Rome bed and breakfast. 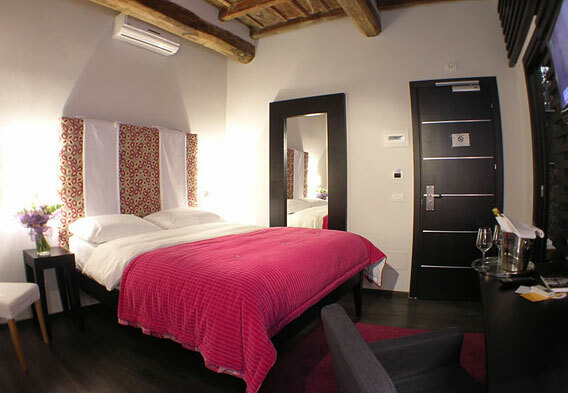 An example of one such hotel is the Trevi B&B Rome (pictured). As its name implies, you can find this hotel near the Trevi Fountain. For more Rome hotel recommendations, check out this slideshow, which highlights some of the city's best upscale lodging choices.